Tarun Tahiliani gave us major fashion goals with pastel banarasi lehengas paired with georgette shirts. Resort saris in crush floral print fabrics and trademark silhouettes in georgette will be perfect for upcoming summer weddings. Mesh separates clubbed with bandhni and satin overlays marked Savio Jon’s comeback to the runway! Kotwara presented a contemporary play on its classics with zardozi and kamdani work on fine brocade weaves and summer voiles. We absolutely loved the lehengas and gharara sets! 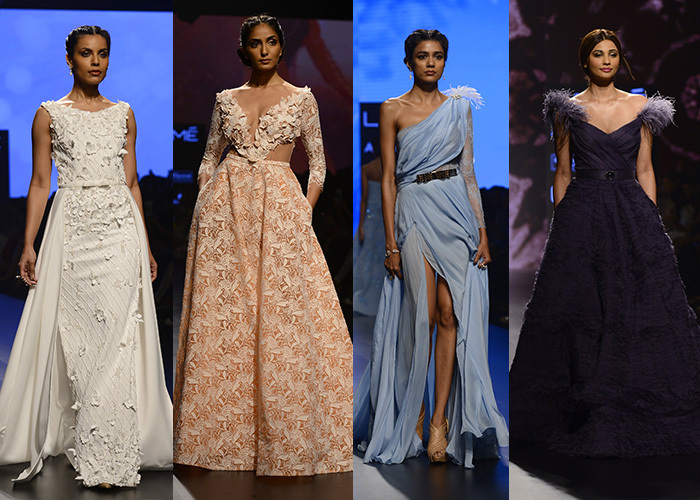 Amit GT showcased opulent gowns in sophisticated hues. We loved the subtle details and hints of shimmer on the floor-grazing silhouettes. Fahd Khatri played with asymmetry on solid hues. 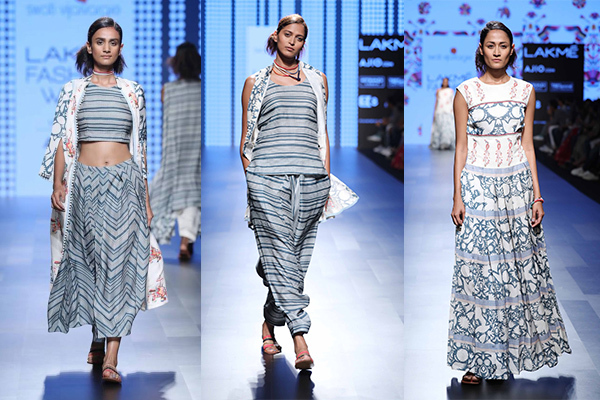 Relaxed trousers, stylised dhoti pants and kaftan style overlays exuded a cool, understated appeal. 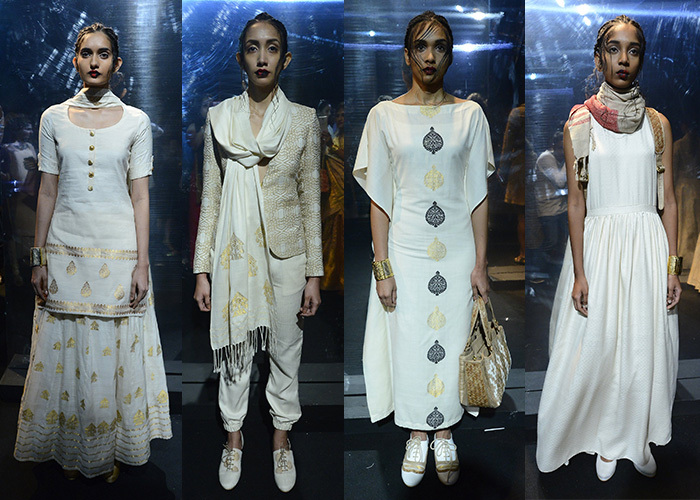 Clean Indian wear and light western numbers in ivory, gold and muted tones defined Nandini Baruva’s line. Nupur Kanoi showcased a gorgeous collection that used intricate glass beadwork in vibrant tribal tones and metallic embellishments. The silhouettes were reminiscent of athleisure, but with a glamorous overtone. 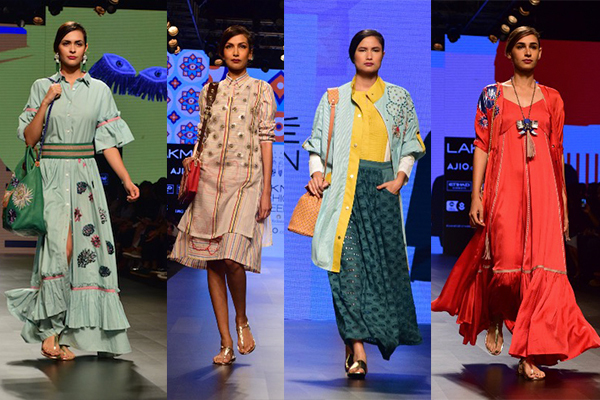 Nishka Lulla showcased a relaxed summer collection in whites, blacks, lilacs and pistachio green, giving way to light pink and bright fuchsia. Cutout dresses, shorts, blazers and mini tunics seen at her show are the perfect choice of outfit for a summer day out with your girlfriends. 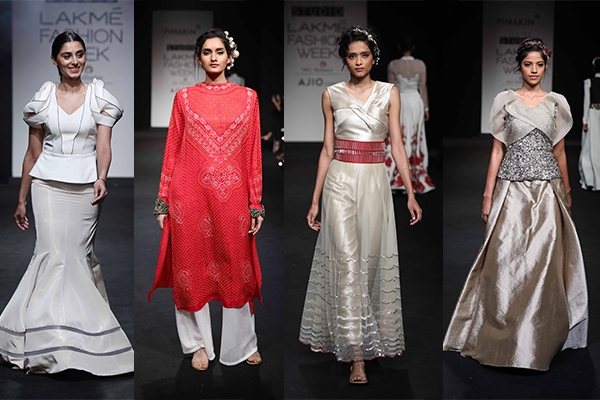 Skirts, jumpsuits, gowns and draped saris in white and gold were seen at Pinakin’s show. The collection revolved around the shades of champagne with hints of red. Other details to watch out for were sharp cuts, minimal embroidery, and contemporary draping. 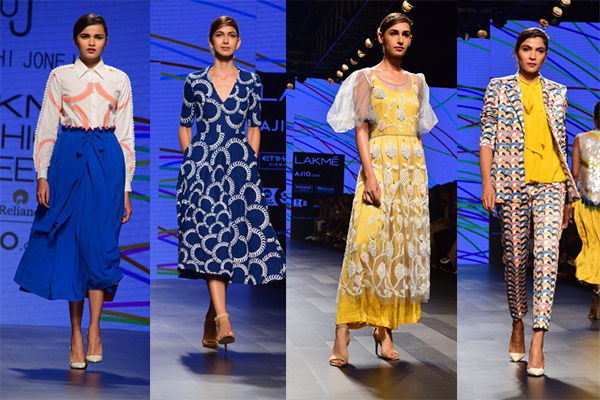 Shweta Kapur’s collection kicked off with monochromes and showcased an interesting collection of summer wear. 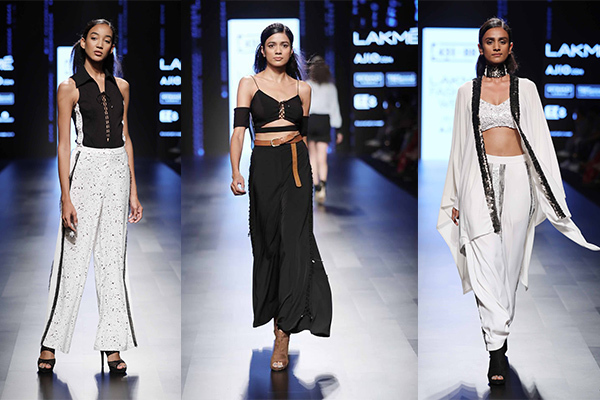 She opted for a darker colour palette juxtaposed with classic summer staples like dhoti pants, shorts and bralettes. 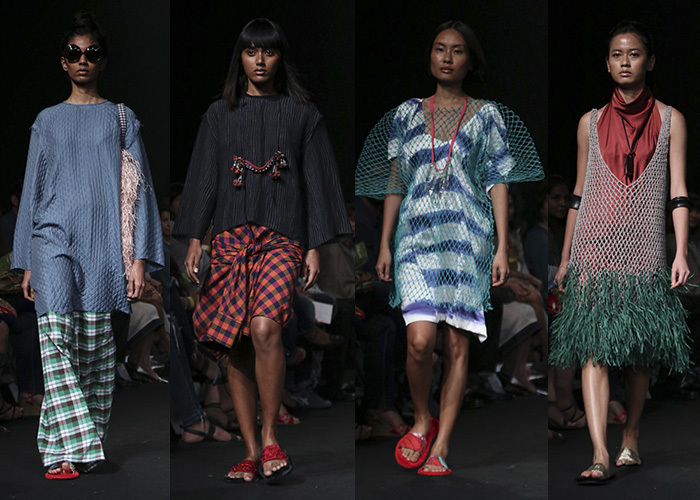 Swati Vijaivargie’s vibrant collection was inspired by the colorful terrain of Mexico. The classic colour palette of indigo and ivory dominated the collection with smatterings of red, pink, yellow, and green. The true taste of summer was showcased through billowing capes, printed jumpsuits and flowy skirts. Sonal Verma of Rara Avis displayed a vibrant holiday wardrobe filled with fun separates in candycane stripes and pop colours. 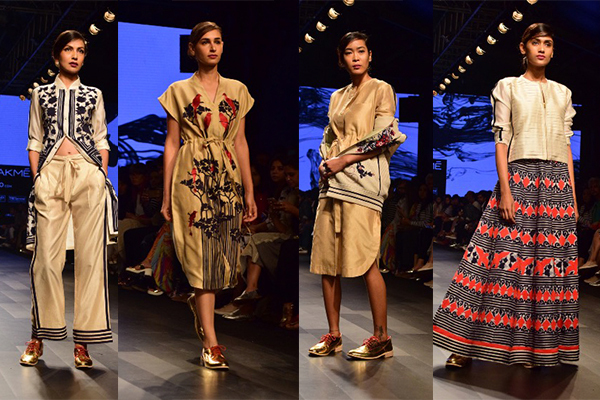 Urvashi Joneja’s collection titled Boundary was an interplay of deconstruction and draping techniques. Drawing inspiration from American artist Tara Donovan’s installations, the summer wardrobe was filled with cropped pants, peplum one-shoulder blouse, pleated jackets and midi skirts. 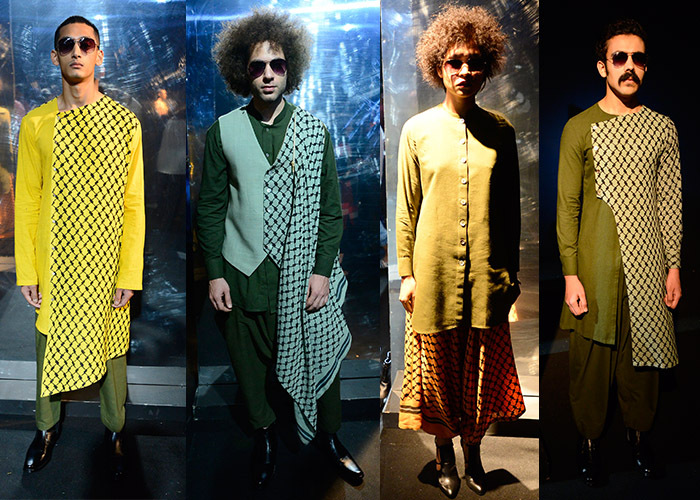 Refined cuts and boxy, oversized garments defined the Ekam wardrobe. Bowties and exaggerated belts were paired with light and fluid silhouettes in olive, beige and ivory.